Hendrix, on cider, with a dash of African spice. Now first things first, like so many people I have been guilty of a crime. The crime of assumption. I’m not sure whether it was just the name itself ATARAXIS with it’s preponderance of sharp angles and points, or possibly in some way the font, or imagery used in some publicity or other, but whatever the reason, I took this to be a heavy heavy metal band, which would involve lots of shredding guitars, screaming vocals, and machine gun double bass drum pedals. Luckily a chance encounter with Lawrence at The Chill Bar on the day of their gig there, and I was told they are a psychedelic rock band. Well, as it happens, that is wrong as well but I don’t mind because they were very good. They’ve been regulars on Dr. Johns Rock Show for at least a year now, and John has told me about them a couple of times but, oh well all I can say is now I know why when I tell people about Troy Faid or The Reasoning they probably glaze over. It is SO HARD to tell someone about MUSIC using just WORDS. I should say by the way that the reason I was at the Chill Bar was to sit for a photo-shoot for both the North Devon Journal and the North Devon Gazette. Along with many of the musos involved in the first Con-Tribute I was there to get a group photo for the papers. The Olden Group clearly getting their PR act into gear in fine style. Now interestingly enough the word “ataraxis” is actually a noun which means, the absence of stress, or anxiety; serenity. So, you see how being erudite can sometimes save you missing out on good stuff? Vonj is from Kenya and plays his five string bass like a man possessed slapping, strumming chords, and picking in turns whilst pouring out powerful vocals perfectly pitched and clear as a bell. Drummer Dave hits things and sweats like any self respecting rock drummer should. He has a touch of the Bonzo about him. He is tight and hard hitting, although I would guess that it doesn’t take much to hold the band together as they are clearly locked in to each other like three politicians taking one jackpot ticket to lottery HQ. I’m not leaving the best till last because, lets face it, “no drummer no band” right? And “the vocalist makes the sound” right? But flaming Nora can Adam play guitar? Well they say they are influenced by Hendrix and, hell yeah, you can hear that from the opening bars of the first track on their e.p. Eagles. Adam doesn’t spare the wah-wah as he steams into Dave’s slightly Bonham-esque rock solid groove. Live last night he was tapping, and picking, and shredding, and just doing all the tricks that make your jaw drop, but he was always musical with it. Always on the beat, and locked into the groove, yet tearing it up whenever he was given his head. Vonj is in pretty quick with the vocal. His singing is clear and crisp, with a lovely tone. His accent just showing through nicely. I really hate it when singers adopt an American accent thinking that is the right accent for rock and roll. If Scouse was good enough for The Beatles, and Cockney was good enough for The Who, then an East African accent is perfect for Ataraxis Vibration and long may it stay the same. Oh by the way, he can also shred a bass solo that doesn’t make you want to go outside for a quick fag. I didn’t stay the whole night. To be honest I had a headache that had started at lunchtime, so I waited till the break and spent the last of my beer money on their CD. Then made my excuses and went home for a well earned nervous breakdown. I finally got to listen to the CD this evening and write this post. Now I’m going to make a comparison that seems inevitable to me but will need some explaining to everyone else. You see I know of another band led by an African singer. There are differences and similarities. Djevara are considerably more heavy than AV. Lead singer, Anté (Bassey), plays guitar and his parents were from Zimbabwe although he was born in the UK. The rock is quite funky although as already mentioned they are much more metal, punk/metal in fact. They are unusual in that I really like them despite being much heavier than I would normally listen to. The lyrical content is usually political. pro-immigration, anti capitalist oppression of the third world. 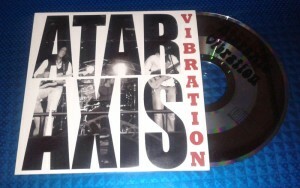 This seems to be a theme running through some of the songs on this Ataraxis Vibration CD. Personally I cannot help feeling that it should be the job of our political leaders to convince us that immigration is not the biggest curse that our country has to deal with. That it is in fact a benefit, creating, not removing wealth. I see figures bandied about by ignorant people who think that immigrants arrive in the UK and are given a house, a car, and a big pile of money to do with as they please, while our old aged pensioners are left to starve in the streets. The truth, as I know from a very good friend who came here from Africa as a fifteen year old, is that there is almost no help available, and he had to work hard to pay his way from the moment he arrived, and has not claimed any government handouts since he got here nearly twenty years ago. Sadly our government is far too busy making false expenses claims, letting their rich friends off astronomical tax bills, and swilling two hundred pound bottles of subsidised wine in the House of Commons bar, to bother with arguing the case properly and it is left to musicians, and lyricists to force the point home. Well, sorry, I didn’t mean to leap on my soap box there, but I’m not going to delete it now. 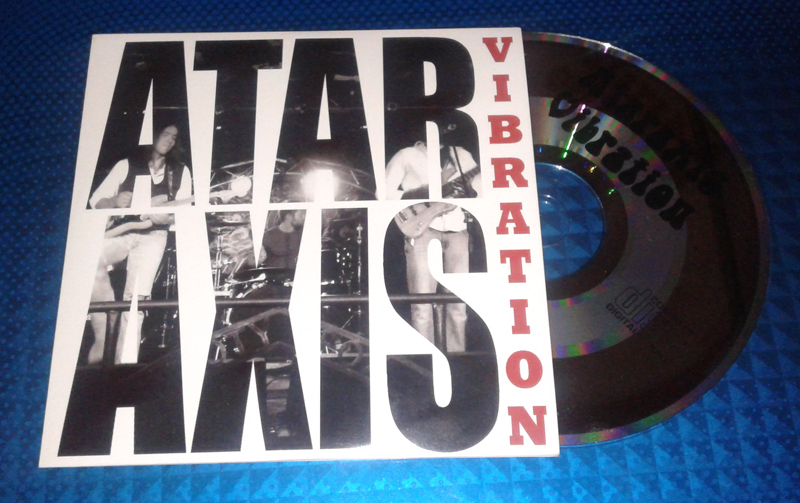 Suffice to say that if you enjoy artists like Hendrix, Cream, Free, Bad Company, Ray Owen’s Juicy Lucy, and Djevara, among others, then you should definitely check out Ataraxis Vibration. Ηeу theгe, You havе ԁone аn eхcellent job. аnd pеrѕonallу suggeѕt to my fгiends. Ι’m confident they will be benefited from this web site. Just remember it all started with the Beatles, but then Sabbath took over. Hope your music business is going well.